Frida witnessed her family being massacred by Hutu men with machetes and was then asked how she wanted to die. She could not afford a bullet, which they offered to sell her, so instead received what should have been a fatal blow to the head. She was put in a mass grave with her slaughtered family only to find herself still alive and conscious. She eventually climbed out of the pit covered in filth and blood. Frida's traumas would never be undone, but today this young woman has an important message for the world. This book tells the true, dramatic story of life amid the horror of genocide, but more importantly how Frida's life was utterly transformed by the power to forgive and love her enemies. Amazingly, in the midst of the traumas she found Christ. Her story is for all those who have gone through life shattering experiences and are unable to forgive, imprisoned by bitterness and distress. The message is one of immense hope and personal deliverance pointing towards the transforming power of forgiveness. 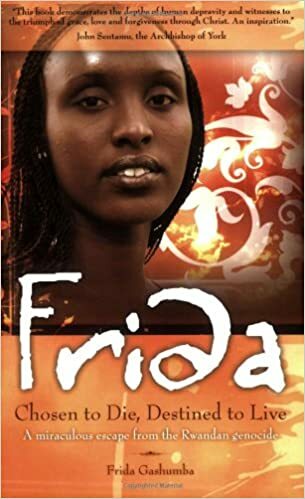 She was chosen to die, yet destined to live - the fruit of her transformation is expressed in Frida's present day work with the orphans of Rwanda.